The Scott Arboretum boasts an impressive collection of plants suitable for growing in the Delaware Valley of southeastern Pennsylvania. Woody plants are emphasized. Plants from Abelia to Zenobia and Clematis to Yucca are cataloged in a document listing all living woody plants. Plant records are maintained in the computerized database, BG-BASE™. All accessioned plants are labeled with aluminum tags containing their accession number and botanical name. There are some woody plants, Brugmansia and Tibouchina for example, that aren’t accessioned as they are not winter hardy and must be overwintered indoors. Despite their tender nature, Brugmansia are fantastic fragrant showstoppers with a floral display that more than compensates for the additional effort required. The genus Brugmansia contains seven species in Solanaceae, all of which are native to South America. According to BGI, Brugmansia Growers International, Brugmansia species are divided into two naturally divided and isolated groups. One group includes the species aurea, insignis, sauveolens, and versicolor and are referred to as the warm-growing group. The other group contains the species arborea, sanguinea, and vulcanicola and is known as the cold-growing group. Don’t mistake the “cold-growing group” for winter hardiness. The term is relative. Members of the cold-growing group are often found in Andes mountain range. Periods of frost are common. Frost may kill the leaves and young branches and shoots. More mature, woody sections possess a degree of hardiness. Once favorable temperatures return, so does new growth. 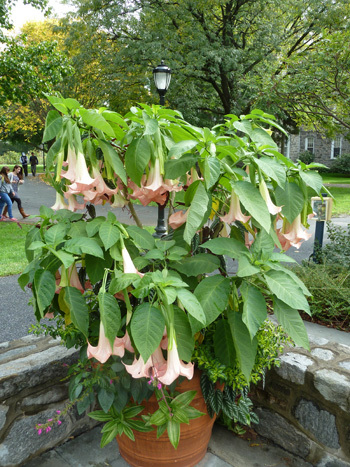 Brugmansia, with their large, fragrant pendulous flowers are often called angel’s trumpets. This common name has often led to confusion with a similar genus, Datura. 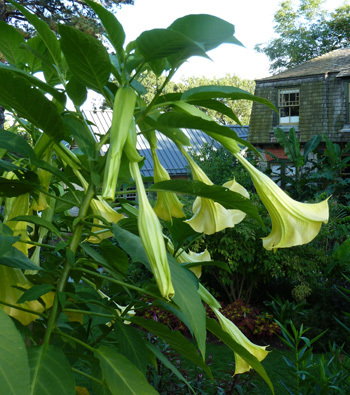 Brugmansia are woody trees or shrubs with pendulous flowers. 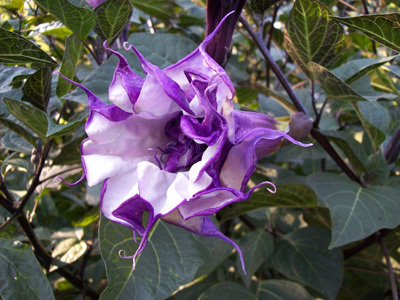 Datura flowers are borne upright and typically have spines on their fruit, a characteristic Brugmansia does not share. Plants may reach heights of 10 – 35’ tall. Leaves, covered in fine hairs, are arranged alternately. All Brugmansia, with the exception of B. sanguinea, are fragrant and attract pollinating moths. Fragrance is most pronounced in the evening. The red-flowered Brugmansia sanguinea is pollinated by long-billed hummingbirds. Flowers are produced in flushes. Mature plants may be dripping with dozens of blooms. After a flush, plants rest and restore depleted energy reserves. New flower buds are initiated and the process begins anew. 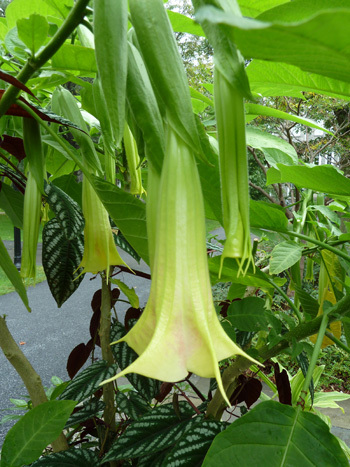 The exception is B. arborea, the shortest of the Brugmansia species, which continuously produces flowers. Another highlight of the species is each flower lasts 4 to 6 days. Flowers of other species last only 2 to 3 days. Dazzling colors are available from lavender and peach, to yellow, rose, orange, and pure white. 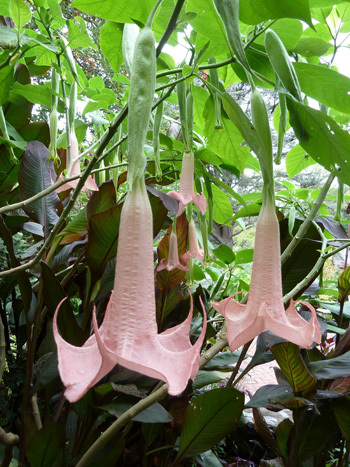 The International Brugmansia and Datura Society, iBrugs, lists a comprehensive cultivar list. The list details the hybridizer/discoverer, parents, flower color, and other relevant information. Personal favorites include ‘Charles Grimaldi’ with orange-yellow blooms and bright pink ‘Cherub’. Brugmansia are easy to grow. Most thrive in full sun. Brugmansia sanguinea enjoys afternoon shade. Plants require copious amounts of water, even more so if container-grown. Drought-stressed plants will drop leaves and cease flower production. A water soluble fertilizer is best for giving plants the nutrients they need. Slow release fertilizers do not release the nutrients fast enough or in a large enough quantity to benefit the plant. Only fertilize during periods of active growth. Brugmansia planted in the ground aren’t fertilized. At the Scott Arboretum, container-grown plants begin with a slow release fertilizer coupled with a weekly application of a water soluble fertilizer. Brugmansia Growers International suggest fertilizing two to three times weekly for large plants. As the first frosts arrive, it is time to begin preparing brugmansias for winter. A frost or two is of benefit. First, the frost has killed the leaves. In the days after the frost, the dead leaves will drop off the plant, saving the need to hand-remove or sweep up. The frost has “told” the plant that it is entering a period of dormancy. 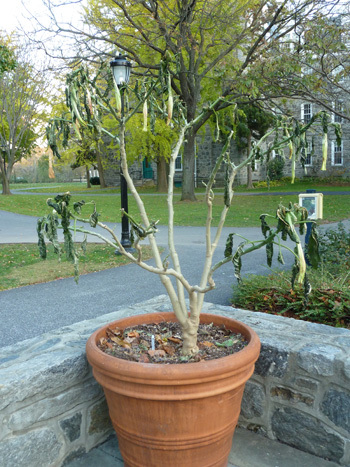 When grown outdoors, Brugmansia are relatively pest-free. Aphids, whitefly, spider mites and mealy bug can become problematic indoors. These pests primarily target leaves and new growth, parts of the plant no longer present thanks to the frost. Store plants in a cool (but not freezing) basement or garage. The lack of light will aid in keeping the plant dormant. Check to make sure the plant stays moist but not overly wet. As warm weather arrives, transition the plant to outdoor growing conditions. Prune off any dead or desiccated branches. 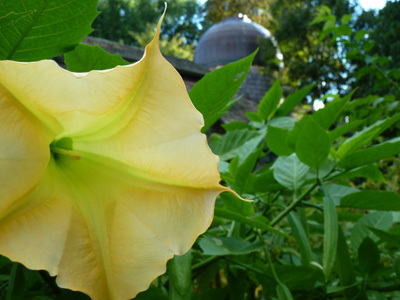 There is nothing like catching the scent of Brugmansia in bloom as the heat of a summer day subsides. Provide a few cultural requirements, and plants will provide vibrant foliage complemented with waves of blooms. Who can resist such appealing attributes? DO YOU SELL RARE BRUGMANSIA SEEDS?? SO YOU SELL RARE BRUGMANSIA SEEDS?? DO YOU SELL BRUGMANSIA SANGUINEA ORANGE SEEDS?? VERSA COLOUR DOUBLE YELLOW SEEDS?? We do not sell any Brugmansia seed. We purchase plants from various vendors, then propagate by cuttings/overwinter from year to year. Good luck in your search for seeds. Yep – no seeds here folks!